Leon Anavi is member of Plovdiv’s hackerspace Hackafe. He is Tizen evangelist and since he got his A10S-OLinuXino is playing to run Tizen on it. For these who don’t know Tizen is the new Samsung OS which is very similar to Android and runs all its apps in HTML5 instead of Java. The advantages to make apps for Tizen – it’s virgin land while Android and iPhone are overwhelmed with any apps in Tizen this is yet to happen and the possibility your app to shine and make break are much better. Tizen is still much Work In Progress, and there is no real hardware for it, Samsung is spreading some Galaxy phones with Tizen firmware on it for selected developers, but actually it’s pretty easy to run Tizen on any ARMv7 device. 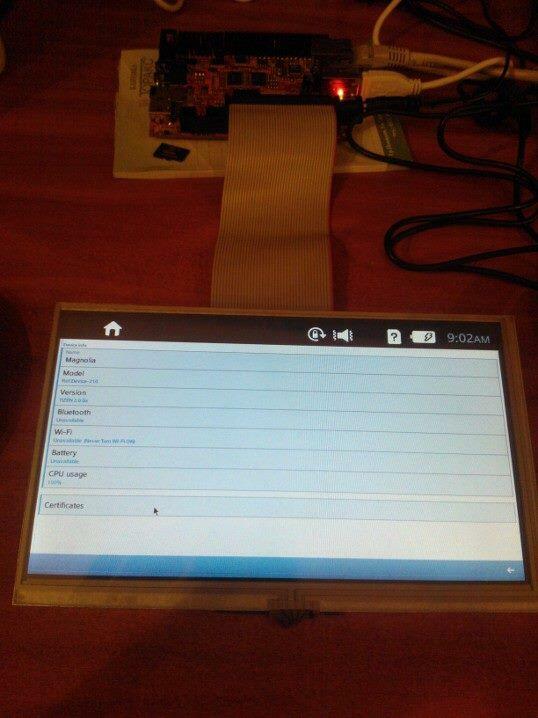 Leon made yesterday his first Tizen tablet using A10S-OLinuXino + A13-LCD7TS and send us picture on how it looks. Thanks for sharing,Could you tell me how to flash the tizen os to A10S-OLinuXino? use sd card?A10S-OLinuXino is setting to sd card load mode?Thank you!My email is im.kloves@gmail.com.